MUSKEGON, MI — It took more than 20 years, but Louis Agnello finished his novel. 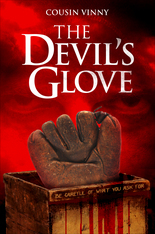 Agnello, who is known as Cousin Vinny, will be at the Barnes & Noble located on 5275 S. Harvey St. on Aug. 22 from 5-8 p.m. to sign copies of “The Devil’s Glove” and to discuss his own personal story. His novel is about a minor league baseball player who seeks help from the Devil to play in the majors. The idea came to him in a dream. The book has garnered national attention and led to a book-signing tour with stops at multiple U.S. cities. He began working on his novel in 1991 and put it aside two years later with approximately 80 percent completed. Twenty years later, Agnello revisited his work and not only finished the last portion, but retooled his previous progress. The life experiences Agnello referred to were in connection to his time in New York. In his heyday, Agnello was called the “Stripper King of New York.” His 13 years of stripping led to the stripper-gate scandal, which eventually put him on the path back to his manuscript. In 2009, while escorting some strippers to a bachelor party, Agnello was shot twice – once in the thigh and another in the chest. Luckily, one of the .32 caliber slugs was stopped by a stack of credit cards that were in his breast pocket. The shot that nearly ended his life jumpstarted his renewed effort toward finishing his writing. His novel, which was originally called “The Magic Glove,” became popular enough to catch the attention of Tate Publishing, a Christian-based publisher. From there it went through changes that included the title. The entire process of getting to know his characters has provided Agnello the chance to take a look in the mirror. The man once known as the “Stripper King of New York” has been touring the country, offering advice and letting his readers know the message of his book. He also is scheduled for a book-signing event 1-4 p.m. Saturday, Aug. 23 in Grand Rapids. The event is set for Barnes & Noble, 3195 28th St. SE in Grand Rapids.